Greater willingness to join a campaign to convince elected officials to take action, especially among men, Generation X, liberals and moderates. 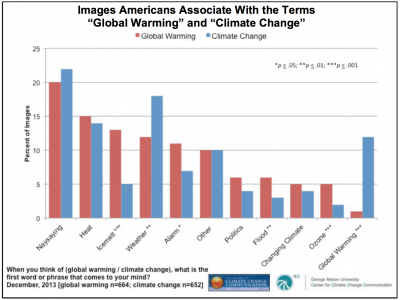 Our findings strongly suggest that the terms global warming and climate change are used differently and mean different things in the minds of many Americans. The following graphic shows how the two terms elicit different meanings for Americans. 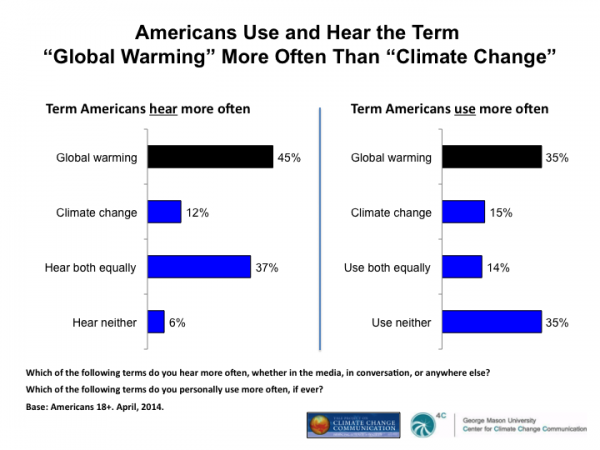 Further, Americans are four times more likely to say they hear the term global warming in public discourse than climate change. Likewise, Americans are twice as likely to say they personally use the term global warming than climate change in their own conversations. The report includes an executive summary, a Google Trends analysis, an analysis of the top of mind associations generated by the two terms, and methodological details.